This is an alternative to conventional medicine, you know the kind that really works. Pain is a subjective perception; it can not be measured by instruments. Medicine has two roles: prophylactic (preventative) and therapeutic (curative). David Moermon. "Cultural Variations in the Placebo Effect: Ulcers, Anxiety, and Blood Pressure". Medical Anthropology Quarterly. Vol 14, Issue 1. 2008. The Placebo Effect. Brian Dunning. "Skeptoid"
Ben Goldacre: Battling Bad Science. TED. More info and links are in the slides on Homeopathy. You cannot understand the effectiveness of a claimed "alternative medicine" without first understanding the power and subtlety of the Placebo effect (and its opposite, the Nocebo Effect). Does homeopathy relieve pain better than no treatment? Yes. Does homeopathy relieve pain better than placebo? No. Can homeopathy prevent disease? No. Does homeopathy work the way its practitioners claim? No. Conclusion: consistent with the placebo hypothesis. The word "homeopathy" comes from the two Greek words "omoios" and "pathos", which mean "same" and "disease" respectively. It originated in the 19th century in Germany with physician Samuel Hahnemann, beginning about 1810. For an excellent description, follow this link. You might want to print a copy to study. In the 19th century, quinine was the marvelous cure for malaria. Hahnemann tried quinine on himself and found that it produced symptoms very much like those of malaria. From this one observation he concluded that "like cures like." To treat a disease you must administer a substance which produces the same symptoms as the disease itself. This refers to the belief that, as a solution is diluted it becomes more powerful. Dilution by a factor of 10 is indicated by "X" and dilution by 100 is noted by "C". A dilution of "3C" is diluted 100-to-1 three times for a total dilution of 106 (one million), which is stronger than 1C. Chemists will roll their eyes at this idea, for they know perfectly well how dilution WEAKENS a solution. This dilution paradigm runs into something very real - Avogadro's Number. This physical constant has a value of 6.023 x 1023. For those who haven't done any chemistry, here's a brief description. All atoms have nuclei made up of protons and neutrons (except hydrogen, which has only 1 proton). The atomic weight is simply the count of protons and neutrons. For example, carbon 12 has 6 protons and 6 neutrons and is the usual isotope of carbon. If we arbitrarily take 12 grams of C12, it will contain 6.023 x 1023 atoms and this quantity will be called one mole of carbon. One mole of iron 56 will weigh 56 grams. And so on... One mole of anything will contain Avogadro's Number of atoms (or molecules if appropriate) and will weigh a number of grams equal to the atomic weight of its molecules or atoms. This bit of very real physics produces a dilution limit. If you dilute one mole of anything by 1024, you are not guaranteed to have even one molecule (atom) of the original substance left! In homeopathic terms, 1024 is 12C. On top of this, the pill is produced by putting ONE DROP of the diluted substance onto a lactose tablet. One Jacques Benveniste thought he had found an explanation for homeopathy. In 1988, he published work claiming that water "remembered" whatever had been dissolved in it before dilution. This got him an "Ignobel" prize TWICE. Read about Benveniste and his work here. Homeopathic remedies are studied by means of "provings", in which healthy people are given doses of a natural substance and then are observed to see what happens. It must be done this way because the "cure" is supposed to cause the same symptoms as the ailment, making testing on patients impossible. In the last 15 years or so, homeopathic remedies have been subjected to at least a little regulation by the FDA. They are considered to have little or no active ingredient, and so the regulation is not like that of real drugs. A Google search for "homeopathic fda regulation" will turn up some good references. The homeopathic organization site has good information, as does a government site. They make recommended reading. Prof. Scalise decided to make sure he did not suffer from insomnia. He had obtained a bottle of homeopathic "sleep aid" (for $11!) at a local store. The safety seal was still intact. Prof. Scalise then proceeded to dump 44 of the 50 pills and swallow them. Took some amount of water to do it, and he reported a chalky taste. Ingredient concentration is not specified on the label. There are 9 active, ingredients, 3 of which are diluted 1X, one is diluted 2X, and the remaining 5 are diluted 3X. Dilution of 3X is a reduction of 1000 times. Also note that the pills are prepared by placing one drop of the diluted solution on a lactose tablet. By the way, Prof. Scalise was still wide awake and going at 5:00 that afternoon. The pills had no effect. Mr. Busby noticed perspicaciously that the box of sleeping pills was a "Non-drowsy formula"! Nature douses dilution experiment. Nature magazine. What's the harm in homeopathy? "The Difference between Hahnemann and Darwin" by U. Kutschera - Skeptical Inquirer Vol. 32, No. 1, January/February 2008. Does acupuncture relieve pain better than no treatment? Yes. Does acupuncture relieve pain better than sham acupuncture? No. Can acupuncture prevent disease? No. Does acupuncture work the way its practitioners claim? No. This is an old, traditional Chinese technique. It supposedly unblocks the flow of chi by using needles inserted at specific points in the skin. The Skeptic's Dictionary has an excellent overview; be sure to read it. Battlefield acupuncture revisited: That.s it? That.s all Col. Niemtzow.s got? Puncturing the Acupuncture Myth it's not ancient, probably not Chinese, and above all, it doesn't work. Does chiropractic relieve pain better than no treatment? Yes. Does chiropractic relieve pain better than massage? No. Can chiropractic prevent disease? No. Does chiropractic work the way its practitioners claim? No. Conclusion: manipulation of any kind provides short-term relief of neck and back pain. Chiropractic originated in 1895 with an accidental discovery by a grocer in Iowa. D.D. Palmer manipulated a lump in the spine of a worker and the man's hearing problem cleared up. From this one sample, Palmer concluded that the spine was the center of everything. Misalignments of the spine could, he figured, cause all kinds of diseases. Read this good description for the details. A question arose about why chiropractic was included in insurance plans. This was not always the case. A lobbying effort by chiropractors got laws changed so chiropractic COULD be covered by insurance. The Affordable Care Act (ACA) passed a few years ago renewed the issue of "complementary and alternative medicine" and insurance coverage. Don't believe that chiropractic is a widespread and lucrative business practice? 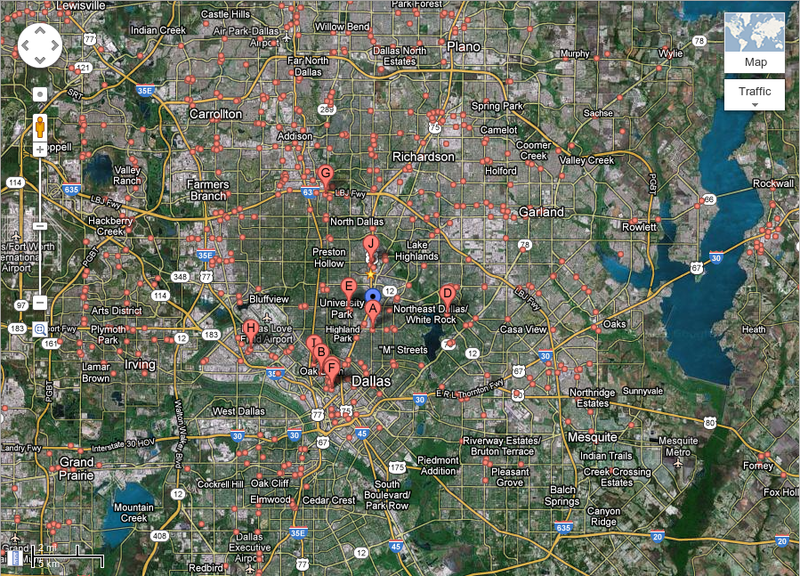 Check out this snapshot of a Google Map, illustrating all the locations of placed in the Dallas area that offer Chiropractic treatments! Are there risks associated with Chiropractic? Yes. Many. Here is some information to help you understand the risks. Because the chiropractic philosophy rejects germs as the cause of disease, there is a lot of documentation showing resistance in the chiropractor community to recommending vaccination to patients who ask about it. Chiropractic professional organizations also have a history of actively campaigning against vaccination (e.g. the polio vaccine). Here are some resources. 503 Chiropractors in Alberta, Canada (about 78% of all the Chiropractors in Alberta at the time!) responded to a survey, in part, about vaccination advice and practices. Immunization issues were raised by their patients according to about 36.5% of respondents. Those chiropractors recommended for vaccination about 25% of the time and 27% of the time against vaccination. 67.8% of respondendent "Answered questions/gave information on risks of immunization or Encouraged/advised patients against having themselves/their children immunized." From: "Beliefs and behaviours: understanding chiropractors and immunization." Margaret L. Russella, H. Stephen Injeyanb, Marja J. Verhoefa, Michael Eliasziwa. Vaccine. Volume 23, Issue 3, 2 December 2004, Pages 372–379. An article by Chiropractors looks into the reasons why many in the chiropractic community work against vaccination. This is a good resource for the official statements on vaccination by the American Chiropractic Association and the claims found in Chiropractic trade publications, etc. arguing against vaccines and vaccination. "Chiropractic Antivaccination Arguments." Jason W. Busse, DC, MSca, Lon Morgan, DCb, James B. Campbell, PhD. Journal of Manipulative and Physiological Therapeutics. Volume 28, Issue 5, June 2005, Pages 367–373. One Chiropractor writes for the American Chiropractic Association trade publication about his experience learning about vaccination in Texas Chiropractic College and relates some anecdotes about how his collegues regard vaccination. This is merely a starting point for further investigation. An archival copy of "Vaccines and Public Health." By Stephen M. Perle, DC is found here. VACCINATION Resolved, that the American Chiropractic Association (ACA) recognize and advise the public that: Since the scientific community acknowledges that the use of vaccines is not without risk, the American Chiropractic Association supports each individual's right to freedom of choice in his/her own health care based on an informed awareness of the benefits and possible adverse effects of vaccination. The ACA is supportive of a conscience clause or waiver in compulsory vaccination laws thereby maintaining an individual's right to freedom of choice in health care matters and providing an alternative elective course of action regarding vaccination. (Ratified by the House of Delegates, July 1993, Revised and Ratified June 1998). They never talk about the benefits of vaccination, only that "...use of vaccines is not without risk." This is silly. Chiropractic is ALSO not without risk. All interventions on the body carry risk. See below for more on that. They speak only about the right to NOT VACCINATE (stress individual right) and not about the right of the community to be protected from harm by a preventable disease through vaccination (the rights of the community). This kind of policy silently encourages rejection of vaccination. Chiropractic manipulation of the neck caused fatal strokes in 45-year-old Lana Dale Lewis in 1996, and 21-year-old Laurie Jean Mathiason in 1998. Reference: Skeptical Inquirer Vol. 28, No. 3, May/June 2004. Kevin Sorbo talks about Chiropractic and his three strokes. BCA drops libel case against Simon Singh! Simon Singh, the highly respected science writer (Fermat's Last Theorem, etc), is being sued for libel by the British Chiropractic Association. The BCA are promoting Chiropractic as treatment for children with (potentially serious) ailments such as asthma and frequent ear infections. Simon Singh criticised this in a Guardian "comment" piece. In particular, he criticised the BCA for doing this without appropriate clinical evidence. He is now being sued for libel. The BCA want damages and an injunction against him saying such things in future. Fundamentally this is about free speech and the use of evidence. An informed and responsible science writer should be able to write about genuine concerns on an important public health issue (the correct treatment for children) without the threat and expense of High Court libel claims. Even if he was wrong, it would surely be enough for the BCA to simply show their supporting evidence. But they are suing him instead. In the words of Frank Frizelle: "Let's hear your evidence, not your legal muscle." featuring Is A Headache Worth Dying For? Rothwell, D., Bondy, S., & Williams, J. I. (2001). Chiropractic manipulation and stroke: A population-based case-control study. Stroke: The Journal of the American Heart Association, 32, 1054. "Chiropractic: A Profession Seeking Identity" by Samuel Homola - Skeptical Inquirer Vol. 32, No. 1, January/February 2008. "A Skeptical Consumer's Look at Chiropractic Claims: Flimflam in Florida?" by Bruce Thyer and Gary Whittenberger - Skeptical Inquirer Vol. 32, No. 1, January/February 2008. Chiropractic school angers FSU professors - Some threaten to resign over the proposed school. It does not involve touching and it is not therapeutic. It involves the claim that a practitioner can detect the "human energy field" and then manipulate it. Note that this field, or "HEF", has never been seen or measured by any objective instrument. The practitioner can supposedly feel the HEF through the hands. In the 1990's, a 9-year-old girl named Emily Rosa did a science fair project in which she tested that claim. If TT practitioners could detect the field, this should be demonstrable. Emily set up a simple cardboard screen with two armholes. The practitioner sat on one side of the screen with arms through the holes at the bottoms and palms up. Emily, sitting on the other side, would flip a coin, and according to the coin would place her right hand over the subject's left or her left hand over the subject's right. She then would say "Ready" and the subject under test would say which hand Emily had placed her hand over. The cardboard screen prevented the practitioner from getting any information visually and Emily gave no other clues. This was a solid test of the claim; any detection of Emily's hand would be through the HEF, as all other clues were shut off. A number (14) of practitioners took part. A total of over 250 trials was run. In the end, the practitioners scored about 50% right, which is exactly what is expected from random guessing. There are claims that wearing a magnet in various places on your body will produce various beneficial effects. The magnets sold for this purpose are made in exactly the same way the fridge magnets you get with various ads on them. If you want more, ask Google for "magnet therapy."